The above info came from atomofish, and was edited by yours truly (contact me). The image came from to2k.co.uk. 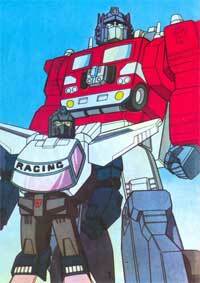 In Transformers: Masterforce, the Destrons (Decepticons) have finally been driven off the Earth. Now, though, there is a new force of Transformers on the planet, and rather than disguising themselves as vehicles or creatures like we're used to, they happen to disguise themselves as human beings! Called Pretenders, these Transformers are lead by Metalhawk (his human identity is simply "Hawk"), and live among the human population. Unfortunately, an evil opposing band of Destron Pretenders begin to stir up trouble, and are lead by the mysterious force known as Devil Z. As Metalhawk and the Pretenders fight, other Autobot Cybertronians add to the growing opposition against the threat of Devil Z and the Destron Pretenders.